There’s a great lineup at Betty’s this Saturday, featuring Philippe Petit, XAMBUCA, Robert Bond, and trans*. French sound artist Phillippe Petit, not to be confused with the high-wire artist of the same name, creates music with bizarre instruments like the Electric Psalterion, Hackbrett Cymbalum, and Yuri Landman’s Caterpillar Drum Guitar. He also employs turntables, synthesizers, and unconventional percussive objects. He’s worked with artists such as Lydia Lunch, Cosey Fanni Tutti (Throbbing Gristle), and Murcof. 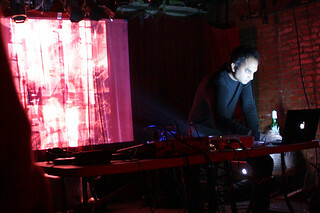 Asheville’s XAMBUCA is Chandra Shukla’s sound art project. Chandra has worked with artists such as Genesis P-Orridge and Hans-Joachim Roedelius (Cluster). Robert Bond is a Nashville percussionist, electronic artist, producer and composer. He was featured on Theatre Intangible episode 105. For this show, he’ll be performing a very special solo set. trans* is a Murfreesboro sound artist utilizing minimalist, vocal-heavy harsh noise. Scott Amendola has launched a Pledgemusic project to fund the recording of Fade to Orange, an piece originally featuring Nels Cline and Trevor Dunn. Guitarist Ross Hammond is featured in the latest issue of Downbeat Magazine (see page 29). Peter Brotzmann appears tomorrow night in Chicago. The Sun Ra Arkestra at London’s Barbicon is reviewed. 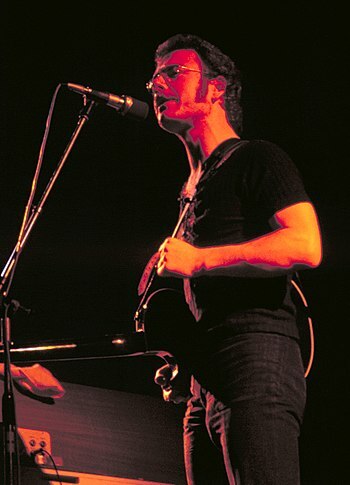 After pledging not to tour again, a new lineup of King Crimson is touring. 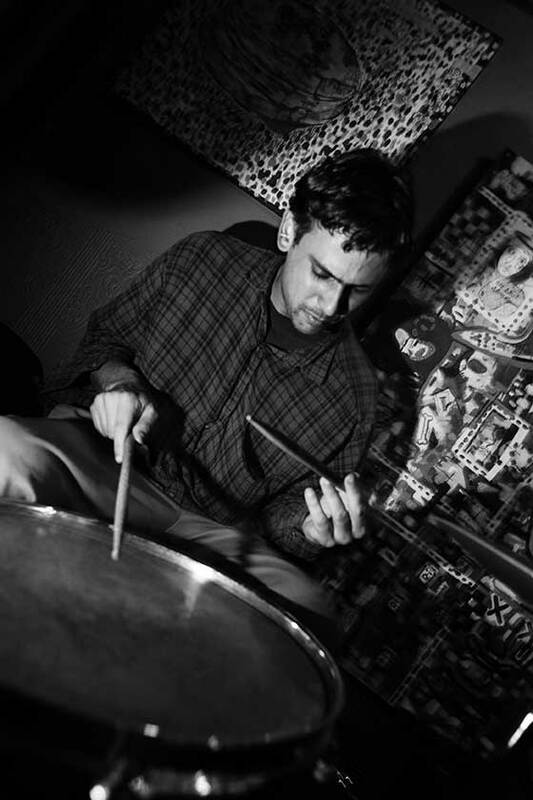 Vijay Anderson is a San Francisco area drummer and composer who has been playing and recording with various creative and jazz musicians for about 20 years. His latest recording, Touch and Go Live at Novara Jazz Festival is available at here and here. His previous recording, Hard Boiled Wonderland is available at Nottwo Records. AMN reviewed Touch and Go Live at Novara Jazz Festival here. Did you grow up with music? How did you end up as a student at Mills? I grew up in Southern California. I started playing drums in 4th grade. I played in school bands and jammed with friends. When I was 13 I was in a band that did 60’s rock songs; Ginger Baker was my favorite drummer. I later became interested in jazz music, joined my high school Jazz band, started going to concerts. Among those I saw were: Eddie Harris, Charles McPherson, Elvin Jones, Joe Henderson, and Pharoah Sanders. In 1996 I started playing with a L.A. saxophone player named Lynn Johnston, who introduced a whole new world of music to me. We played music by Thelonious Monk, Ornette Coleman, Albert Ayler, as well as Ellington and various odd standards, and other cover tunes. This experience was a huge influence on my musical life. Over a decade later, I decided to go back to school, after years of performing as a creative/working musician. I went to Mills, primarily to study with Roscoe Mitchell and William Winant. Luckily I got a scholarship, which made it possible. How did the Mills experience influence your career? I wanted to broaden my perspective and get better as a musician. I definitely have more confidence as a composer now. I wrote a lot of music at mills, which slowly evolved in to what you hear on the Touch and Go record. Do you consider yourself a primarily a free-jazz drummer, a composer, both, something else entirely, or does it really matter? I am a musician who plays the drums, and writes music. Most wouldn’t call Touch and Go at Novara Free Jazz. There are however projects which rely heavily on improvisation where this term would be apt. I love playing original music by my peers, playing Monk tunes, old standards, improvising, and folk tunes. I enjoy playing and am inspired by almost everything: rock, funk, blues, odd times, odd textures, african and cuban rhythms, and of course bebop, modern jazz, and old swing music. I am not saying I have mastered these forms, but I do like being able to utilize any of these ingredients when I see fit. The masters of “Jazz” drumming will always inspire my approach to percussion, people like: Denis Charles, Max Roach, Eddie Blackwell, Rashied Ali, Sunny Murray, Philip Wilson, Frank Butler, Gerry Hemingway, Baby Dodds, I could go on. As a working/creative musician I usually try to incorporate whatever is necessary to the particular situation at hand. When discussing regional creative music scenes, New York, Chicago, DC, and London often pop up. But it seems as if the San Francisco area just keeps cranking out great music. What is the scene there like, and how has it evolved? I have been living in the San Francisco Bay Area since 1996. There has always been a strong underground jazz/experimental music scene. Musicians such as Glenn Spearman, Hal Stein, Eddie Marshall, Bishop Norman Williams, Vince Wallace, Ed Kelly and Donald Bailey set a high a bar out here. I feel very fortunate to have been able witness most of those musicians and that aspect of the bay area’s history. Drummers like Donald Robinson, Spirit, Vince Lateano, and Willie Winant are still here, and perform often. Groups like the Rova saxophone quartet, who have been at it for 35 years, as well as SF Sound, are consistently creating singular music. Francis Wong, Hafez Modirzadeh, John Schott, Positive Knowledge with Oluyemi and Ijeoma Thomas are just a few of the outstanding players making noise outside the mainstream. The influence of Mills is hard to ignore. With teachers like Fred Frith and Roscoe Mitchell (among others) there, it makes the bay area a desirable destination for creative musicians of all stripes. Reliable venues playing restless forward leaning music are: Center For New Music, Duende, the Sound Room, The Luggage Store, Simm Series at the Musicians Union Hall, the Berkeley Arts Festival, The Active Music Series at the Uptown, Studio Grand, The Monday Makeout at the Makeout Room. If you come to the Bay Area check out bayimproviser.com, a great source for improvised music and its offshoots. Two of your most recent releases, Hard-Boiled Wonderland and Live at the Novara Jazz Festival, are both sextets in which you do most of the writing, and feature three members in common. How are these groups and compositions similar or different? The Live at the Novara Jazz Festival record features composed material with freedom of expression (improvisation) in specific areas, whereas the Hard-Boiled Wonderland record is solely improvised. In both groups, I was incredibly fortunate to have incomparable players. The Hardboiled Wonderland Record features Sheldon Brown and Ben Goldberg on reeds, Smith Dobson V on vibraphone, Ava Mendoza and John Finkbeiner on guitars, and myself on drums. This was the first time these 6 musicians played together. I’d been involved in a trio with Ben Goldberg, and Sheldon Brown, and a trio with Ava Mendoza and John Finkbeiner. I decided to combine the two groups, add Smith on vibraphone and record it. There were no rehearsals. It was purely improvised. The “Live at Novara Jazz Festival” recording, features the Touch and Go Sextet, which consists of Ben Goldberg on clarinet, Sheldon Brown on saxophones/ clarinets, Darren Johnston on trumpet, Aaron Bennett on saxophones, and Lisa Mezzacappa on bass. I wrote/arranged this music with the intention of featuring the personalities of each musician. I was interested in counterpoint and harmonic movement, and how to incorporate improvisation in to this context. I am a huge fan of Henry Threadgill, Ray Anderson, Charles Mingus, John Carter, Duke Ellington, and Julius Hemphill. 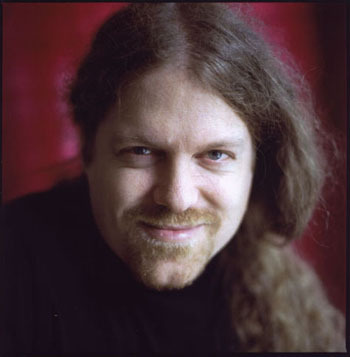 Playing in Adam Lane’s Sextets and Graham Connah’s various groups was also a significant influence on this music. Is Hard-Boiled Wonderland based in any way on the novel of a similar title by Haruki Murakami? Yes, I was reading that book while mixing this record. The group was two different trios combined to make a sextet. Hard-Boiled Wonderland and The End Of the World is two seemingly separate stories or perspectives which are revealed to be related in the end. It made sense to me. The music reminded me of the book in some enigmatic way. If you had more time to dedicate to music, would it go toward your own compositions or to playing live with more people and absorbing different styles? Yes. I enjoy composing music but being involved in other projects where I can focus on my drumming is rewarding and challenging in a totally different way. I’m up for almost any kind of improvisation. Any upcoming release or recording plans for the rest of 2014? The trio I mentioned early with Ben Goldberg and Sheldon Brown is called Goldberg, Brown, and Anderson. We improvise, but we’ve played with each other so much that it sounds almost composed. Sometimes. We have been discussing doing a studio recording sometime this year. I also would like to record a project with Aaron Bennett, John Finkbeiner, and Robert Overbury. This is a cover band the plays music by Thelonious Monk, Roscoe Mitchell, Ornette Coleman, Duke Ellington and standards. A few Adam Lane groups, including the return of his trio with Vinny Golia, and his project with pianist Connie Crothers, Virg Dzurinko and Daniel Carter. Marco Eneidi’s Shattered Trio, Jon Raskin’s Trio, both with Lisa Mezzacappa on bass, and most recently Sheldon Brown’s 10 piece Ensemble which is making its world premiere at the S.F. Jazz Festival on June 15, 2014. Pop on over to The DiMenna Center for Classical Music on June 14th to savor a sweet and salty mix of fresh and innovative New Music! Kettle Corn New Music (KCNM), founded by Alex Weiser, Chris Rogerson, Emily Cooley, Loren Loiacano, and Ryan Harper, features an eclectic variety of New Music performers and composers in a casual, welcoming atmosphere. Showcasing musical concerts of avant-garde composers sans staid formalities is the raison d’être of KCNM, a refreshing musical phenomenon on the cutting edge of New York City’s contemporary music scene. KCNM will conclude its second year of productions with a performance by Typical Music, the Downtown chamber trio comprised of KCNM artist-in-residence Todd Reynolds and the Bang On A Can All-Star’s Ashley Bathgate and Vicky Chow. Additionally, new works by Alex Weiser and Emily Cooley will be performed, as well as the world premiere of Todd Reynold’s rousing new composition. Live dates with Andrew Drury. Also, read our in depth interview with Andrew. Chris Stover (trombone, compositions), Russ Johnson (trumpet), Niels Praestholm (bass), Andrew Drury (drums). This performance takes place at the ISIM (International Society for Improvised Music) conference which is being held this year at the New School in New York City. Featuring Chris Stover (trombone), Russ Johnson (trumpet), Niels Praestholm (bass), Andrew Drury (drum set). Agusti Fernandez, Jane Rigler, Andrew Drury + others tba! A Don’t Miss. What better way to inaugurate the new Steinway L grand piano at Soup & Sound than with Agusti Fernandez who is making a rare visit from Barcelona?! He has been one of my favorite pianists since I heard “Mandorla”–an exquisite duo cd with him and flutist (and sage) Jane Rigler. Agusti and Jane will perform, as will some of Agusti’s colleagues (tba), and Andrew Drury (percussion). Bogota in Brooklyn. Set 1–Ricardo Gallo (piano) and Alejandro Florez (guitar/tiple). Set 2–Ricardo Arias (electronics), Ricardo Gallo (piano), Nate Wooley (trumpet), Andrew Drury (percussion). Outdoor performance (rain or shine!) at Art Omi featuring cellist/composer Loren Dempster with a group of musicians and several dancers choreographed by Silas Reiner, performing around and under a large wooden sculpture designed by Harrison Atelier. Performers include Loren Dempster (cello), Alex Waterman (cello), Erica Dicker (violin), Christa Robinson (oboe), Andrew Drury (percussion) and more tba! Jason Stein (bass clarinet–from Chicago), Pascal Niggenkemper (bass), Andrew Drury (drums). Also Josh Sinton plays a set. Michael Lytle (bass Clarinet), Eyal Maoz (guitar), Andrew Drury (drums).